The alleged crime ? - voting against a Senate bill that would have established English as the official language of the United States. Newsweek did not reveal the names of the four senators. But a May 20, 2009 Huffington Post story by Military Religious Freedom Foundation Senior Researcher Chris Rodda does: Democratic Party senators Dodd, Biden, Clinton, and Obama. It was not the first time that Jim Ammerman has suggested or called for the execution of top US government leaders from the Democratic Party. Unlike common stereotypes of those who promote such incendiary views, Jim Ammerman is neither a right wing talk show host or on the militia movement fringe. Through his Chaplaincy of Full Gospel Churches, retired Colonel "Jim"Ammerman presides over more than 270 active duty military chaplains, perhaps 7-8 percent of the active duty chaplain force. Ammerman says he was a friend to the late General William Westmoreland, claims both Texas megachurch pastor John Hagee and Word of Faith televangelist Kenneth Copeland as current friends and states that his agency works with three and four star generals and has allies at the highest levels of the Pentagon as well as in the US Congress and Senate. The June 20, 2009 Newsweek story by journalist Kathryn Joyce, "Christian Soldiers: The growing controversy over military chaplains using the armed forces to spread the Word", explored Jim Ammerman's involvement in a recently exposed scheme to distribute native-language Bibles in Iraq as well as the controversy surrounding reports from a nonprofit watchdog group, the Military Religious Freedom Foundation, of an extensive pattern of illegal and sometimes abusive Christian fundamentalist religious proselytizing in the United States Military. Founded by Air Force academy graduate and Reagan Administration lawyer "Mikey" Weinstein, MRFF was at the center of a May 2009 story, about the spread of fundamentalism in the US military, published in Harpers Magazine. From the late 1990's and up into the 2008 presidential election, Retired Colonel Jim Ammerman has engaged in a pattern of anti-government agitation and, along with one of his top chaplains noted in the Newsweek story, James F. Linzey, has gone on national speaking tours to promote a class of New World Order and Federal Reserve conspiracy theory which has been widely credited with helping inspire acts of right wing violence and also the rise of the militia movement in the 1990's. But these conspiracy narratives are not secular; they are interwoven with apocalyptic Biblical narratives and presented as "Bible prophecy." James F. Linzey's conspiracy theories, which Major Linzey promoted in 2005 during a Prophecy Club speaking tour and through appearances on Christian media venues in 2005 and 2006, had an overtly racialist, anti-immigrant slant and both Ammerman and Linzey have each publicized a conspiracy theory, long ago debunked, claiming that foreign Jewish banking concerns, including "The Rothschilds", control the American economy through the Federal Reserve. The Anti-Defamation League identifies that class of conspiracy theory as A Classic Anti-Semitic Myth." Holocaust Museum shooter James W. von Brunn promoted that particular conspiracy theory in his writings. Experts who study the relationship between conspiracy theory and right wing violence, such as Political Research Associates Senior Analyst Chip Berlet, suggest such conspiracy theory feeds a cultural climate that can provoke acts of violence against targeted, demonized groups in society. "Linzey's description of the alleged NWO conspiracy is tainted by historic antisemitic claims and encourages the scapegoating of Jews as part of a global plot. Similar claims made in the 1990s helped mobilize the armed citizens militia movements and provided the justification for some to prepare for conflict which led to violent confrontations with government agents. Linzey has adopted wholesale the standard Illuminati/Freemason conspiracy theory about the NWO featured by Patriot groups such as the John Birch Society. Linzey however also echoes antisemitic claims such as those found in the notorious hoax document the Protocols of the Elders of Zion, where Jews are named as the ultimate ringleaders. When Linzey talks about the "world bankers" he is using language that is readily recognized by antisemites as meaning "Jewish Bankers." "
For James F. Linzey, illegal immigrants also appeared to be centrally in the crosshairs. Linzey served as the head command chaplain for the Operation Iraqi Freedom troop mobilization and can be seen in photographs shaking hands with Army head Pete Geren and Navy Admiral Mike Mullen. Both Jim Ammerman and James Linzey have promoted dire conspiracy theories warning that a United Nations takeover of the United States, with the help of foreign troops hidden in national forests and military bases, is imminent. In a January, 1997 talk that was videotaped and broadcast nationally over scores of radio and TV stations, and subsequently cited as evidence in a subsequent Pentagon review of Jim Ammerman's activities, the military chaplain endorser called for the execution of then-president Bill Clinton, for alleged treason. President Clinton had signed a secret edict, claimed Ammerman, which in the event of a national emergency would pass control of the government over to the Secretary General of the United Nations. Bill Clinton had also established himself as a dictator, established "nature worship" as the national religion, outlawed Christian churches, established secret FEMA detention centers and, in league with the United Nations, hidden up to 1.3 million Chinese, Russian, German, and UN troops in National Forests and on domestic military bases. [Below: Retired Colonel Jim Ammerman declares existence of up to 1.3 million foreign troops hidden in US National Parks and on military bases. During the talk, Ammerman stated that he had been in communication with US military commanders "at the battalion level and above" who were considering taking action against "domestic enemies." Ammerman also suggested his chaplains functioned as a private intelligence network which he could use to influence foreign policy outcomes. Jim Ammerman gave the January 1997 speech during the second of two national tours, in 1996 and 1997, during which Retired Colonel Ammerman, introduced to his audiences as having "top level [US government] security clearance" and, armed with a Powerpoint presentation filled with dubious and wholly invented bullet-points, told audiences, at paid speaking engagements, that the United States government was imminently ready to institute a police state and throw dissidents into concentration camps. The context was explicitly religious. 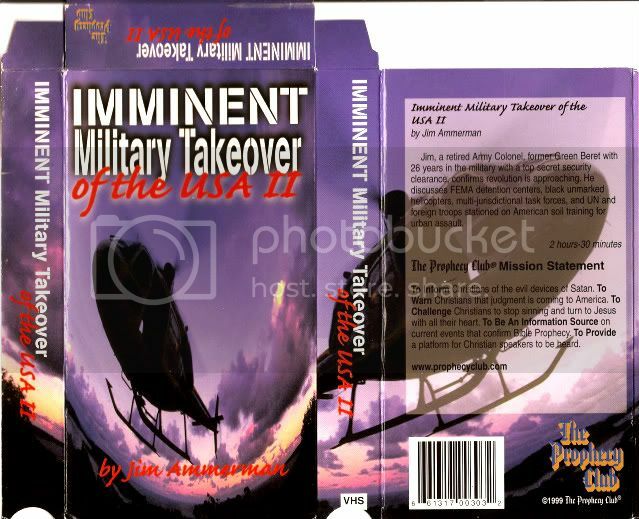 The "imminent military takeover" Ammerman warned his audiences of would be the last stage in the establishment of a one-world government, a satanic New World Order under the Antichrist. Behind the conspiracy, which ultimately traced back to Lucifer's "coup plot" against God according to Ammerman, were Illuminati and Jewish bankers who, through control of the US Federal Reserve, ruled the American economy. Ammerman claimed those same bankers, led by the Rothschild banking family, also controlled the economies of the United Kingdom, Germany, Italy, and France. Bill Clinton secretly took orders from Hillary Clinton, declared Ammerman, because she outranked him in the Illuminati. The Illuminati organization had been created specifically to destroy America's freedom and, in league with "world bankers" who were almost exclusively Jewish, Illuminati were working to financially enslave and bankrupt the US middle class. Jim Ammerman gave his presentations under the auspices of an industrial-scale antigovernment agitation effort run by a Topeka, Kansas Christian ministry called The Prophecy Club which organized seditious public presentations, videotaped and sold in VHS cassette format and also nationally broadcast by Prophecy Club affiliate stations numbering, at the Club's height in the late 1990's, over eighty radio stations and twenty five TV stations with a theoretical broadcast reach of roughly ten percent of the American population. At its peak, Prophecy Club speakers addressed audiences in forty US cities across America each month. Many Prophecy Club speakers claimed to have US military or government experience, high level security clearances, and insider's knowledge of sinister government plots. Their conspiracy theories narratives were surprisingly uniform and conveyed a clear message; the government was the enemy. Some of the Prophecy Club's speakers, such as Texe Marrs, were unabashedly anti-Semitic. One, Fritz Springmeier, is a white supremacist who was convicted in 2003 of bank robbery and can be seen in a Prophecy Club videos [1, 2] viewable on Google Video and Youtube, giving presentations on the "Bloodlines of the Illuminati" and addressing an audience with the message that reptilian alien/human hybrids can be identified by the shape of their eyes. Springmeier, author of an influential conspiracy theory book "The Thirteen Bloodlines of The Illuminati", has helped spawn an entire subclass of conspiracy theory now currently being mainstreamed through a hit pulp fiction series, the "Band of Brothers" books written by GodTV co-founder Wendy Alec. The Prophecy Club has been almost wholly neglected by contemporary historians but from its inception in 1993 through its heyday in the late 1990's and into the current decade the club has retailed to audiences across America the sort of far-right, anti-government New World Order and Federal Reserve conspiracy theories widely credited with helping to inspire the rise of the white supremacist and anti-government militia movements during the 1990's. According to some reports Ammerman's Prophecy Club videos circulated widely during the late 1990's among the burgeoning militia movement. Kansas court records appear to indicate that Scott Roeder, accused of murdering Kansas abortion doctor James Tiller, worked for The Prophecy Club during the late 1990's when Jim Ammerman was doing speaking tours with the ministry. As a subsequent Pentagon investigation into the retired Colonel's 1997 public speaking activities revealed, Jim Ammerman had stated, in a January 7, 1997 radio broadcast, that foreign troops were being trained at Fort Hood, in Texas. At dawn on the Fourth of July, 1997, two militia movement members were arrested, outside of Fort Hood, armed with 1600 rounds of ammunition, ready to attack the foreign troops they believed were stationed at the base. 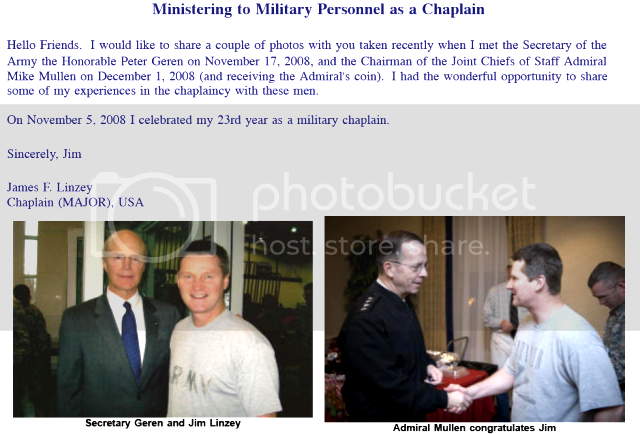 a. Chaplaincy Full Gospel Churches chaplains, commissioned in the Military Services, may be used and/or solicited to be used as agents to collect and convey military intelligence information for Mr. Ammerman's political purposes." Lezy's letter also cited "Mr. Ammerman's encouragement to to affiliate with organizations considered prohibited to military personnel for reasons of their supremacist viewpoints, promoting intolerance, and being detrimental to the good order, discipline or mission accomplishment..."
The third issue of concern was "Mr. Ammerman's videotape presentation 'The Immanent Military Takeover of the USA' and his audiotaped NewsWatch radio interviews in which there is the suggestion of a military overthrow of the United States government." During the current decade conspiracy theories, wrapped in a veneer of Biblical prophecy, alleging that "Illuminati" and "world bankers" control the US and world economy and are scheming to set up a satanic "New World Order" police-state system, have been globalized and are now distributed by Christian media over broadcast networks that can reach hundreds of millions worldwide. San Antonio Cornerstone Church pastor John Hagee, criticized during the 2008 election when apparently anti-Jewish comments by the pastor surfaced after Hagee had endorsed GOP presidential hopeful John McCain, Jr., had by the middle of the current decade achieved a broadcast capability which could reach into the homes of up to 100 million families worldwide. As with Jim Ammerman and James F. Linzey, Hagee has promoted, wrapped in a pretense of "Bible Prophecy", New World Order and Federal Reserve conspiracy theories which identify the Rothschild banking family as the chief foreign financial power controlling the US economy and scheming to undermine American patriotism and bankrupt the middle class by devaluing the dollar. GodTV, which broadcasts from Jerusalem and claims its networks can reach several hundred million worldwide, has recently aired a series featuring New World Order Federal Reserve conspiracy theorists including Gary Kah and Paul McCguire. Kah's list of Jewish banking concerns he claims control the US economy is extremely similar to the lists cited by Jim Ammerman and James Linzey. Such conspiracy theories have diffused widely through American society. A search of YouTube videos using the terms "New World Order" and "Obama" produces over 80,000* results, many of which are videos claiming President Obama is part of an alleged, grand New World Order conspiracy. Fused with Christian supremacist narratives claiming America was founded as an explicitly Christian nation, New World Order conspiracy narratives have permeated American government and politics, and the United States military. Because the theories are disguised as Biblical prophecy they can be spread readily, to little notice from secular society. Last August 9, 2008 during a sermon at the Sioux Falls, South Dakota Cornerstone Church Jim Ammerman declared that Barack Obama was secretly a Muslim and predicted that if the Illinois Senator won the election, "we won't have a president very long" because Muslims would try to murder the new president - for betraying Allah. If candidate Obama chose Hillary Clinton as his vice presidential running mate and won the election, pastor Ammerman continued, Bill Clinton would arrange for Obama to be killed because "[Bill] wants back in the White House." *note: the number I originally cited was "over 90,000". That was incorrect - the number should have read "over 80,000"
Linguistic anthropologists have solidly tied "English Only" (English as official language is the first step) to racism and a move to keep ethnic minorities out of the mainstream and marginalized. So in effect Ammerman is advocating the death of senators because they OPPOSED racism. But then, as you demonstrated, dominionism is tied to racism anyway (antisemitism is one form of racism). Dominionists don't like non-assimilated people- and a sad fact is that an assimilated person can be more hostile against their own than an outsider. It is extremely helpful for myself. Substantial usb right up due to this weblog offered! It is no surprise that they are most of Oakley Sunglasses Sale the model of choice for skilled sportspeople.